Love both of these looks! I am all about cute and cozy for Thanksgiving! I love the idea of sequin sweatpants! I need stretchy pants for Thursday! I'll be wearing an outfit like the one on the left, only my denim/chambray won't have polka dots. :) Have an awesome holiday!! I'm def going to be casual this year...More room for food!!! LOVE the sequin slouchy pants!! great diagram! Love those riding boots and that gorgeous necklace! Cute outfits! 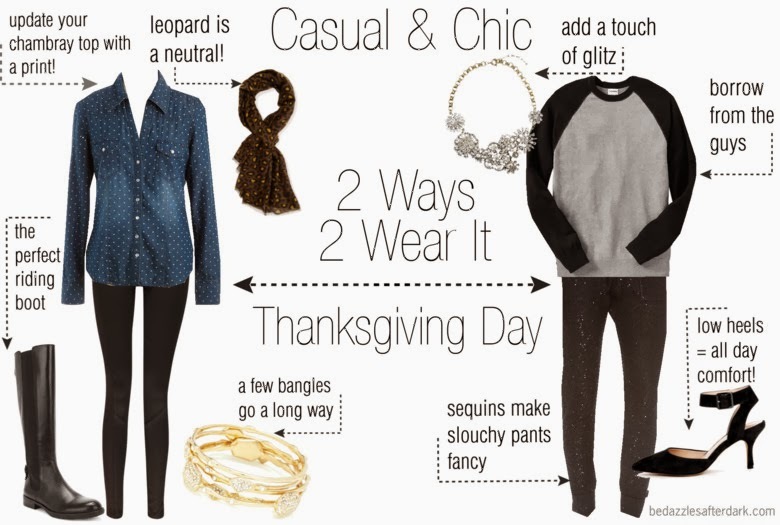 Excellent Thanksgiving outfit guide- I'm going with skinny jeans with lots of stretch (ha! ), tall boots, and a slouchy sweater. Cozy!